You want to be an X-Man, don’t you? Sure, playing as Wolverine is fun, but being able to feel immersed in a new character can be even better. Letting us choose our own path and create our own story can make us feel like the character is an extension of ourselves, instead of feeling like we’re a kid running around in a Wolverine costume. This is the promise of Silicon Knights’ X-Men: Destiny: to let us live in the X-Men world in a way that other super-powered games haven’t. To let us make our own choices, customize our own hero, and pave our own destiny. Surprisingly, it just about pulls the concept off… but that’s about all it does right. X-Men: Destiny takes place out of Marvel continuity in a dark, depressing future in which Professor X has been killed by a robot named Bastion. Things haven’t gone well since the head of the peaceful side of the mutant/human relations movement was cut off – the X-Men have drifted apart, a militant, anti-mutant organization called the Purifiers assaults mutants in the streets, and Xavier's School for Gifted Youngsters has been shut down and moved to the earthquake-plagued West Coast. Things reach a boiling point during a rally in San Francisco, where a statue commemorating peace is thrown through the streets in an apparent attack by Magneto, who disappeared after Xavier’s assassination. But as luck would have it, the mutations of Japanese refuge Aimi Yoshida, meat-head jock Grant Alexander, and anti-mutant extremist Adrian Luca manifested just as the attack began. After choosing between these characters, each with a unique personality and motives, we picked a power – again from a pool of three, and began to draw lines in the sand in a world on the brink of all-out war. Throughout the game we’re asked to make the occasional moral choices, siding with either the Brotherhood or the X-Men in how we approach different missions. Sometimes it’s a minor decision – do we let the Purifier general live, or do we kill him? Other times it’s more direct, and involves taking a stand beside Magneto or Cyclops. The choices are a far cry from the ones found in games like Mass Effect, Deus Ex, and Infamous, but they’re serviceable in adding some replayability and giving us the feeling we’re involved in the events instead of just watching them unfold. Also helping us feel connected to our heroes is Destiny’s character customization. 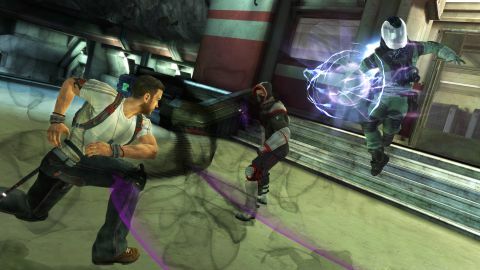 While there are only three choices initially, more are unlocked throughout the game, as well as separate skills for each power type, multiple costumes with unique abilities, and collectible X-Genes that allow equipping of offensive, defensive, and utility powers, such as Ice Man’s ability to freeze foes, Wolverine’s regeneration, and Colossus’s durability. All of the abilities have direct connections to the game’s combat which, while not entirely complex, gets the job done. It plays like a scaled-back God of War, with combo-based attacks and multiple powers that made us feel extraordinarily powerful. By the end of the campaign we felt right at home fighting beside popular characters from the X-Men comics, which is something that many other games have failed to accomplish. Power doesn’t mean much if we don’t have anything to do with it, though, and that’s where X-Men: Destiny begins to stumble. With the exception of a few interesting boss battles later in the game, most of the encounters are dull. Gaining a new ability enhances the next few fights, but a majority of the battles take place in sectioned-off arenas and had us fighting the same handful of foes from beginning to end. Even with our power growing and new abilities being learned we still handled combat exactly the same throughout. New mechanics arrive rapidly in the first half of the six-hour campaign, but after that it’s just the same battles over and over again. Even if encounters had been consistently fun, X-Men: Destiny would still simply feel unfinished. The presentation varies between passable and intolerable. It often looks like an HD remake of a last-gen game – some characters, like Cyclops and Magneto look good, with strong character models and impressive voice acting, but others, like Mystique and Emma Frost, look absolutely offensive, with character models that look like they were brought over from a GameCube game. It’s like they had time to go through and finish some of the character models and not others, and it’s quite distracting. There are even times where the lack of polish bleeds into the game’s cutscenes and makes the story harder to follow. Certain animations are missing entirely, and we were sometimes confused by what characters were talking about as they stood motionless and described things we couldn’t see. Other times they’d talk over each other, making important plot details hard to follow. We were eventually able to figure it out, but it took us out of the moment and represents a level of shoddiness that shouldn’t exist in modern games. We’re not too sure that a few months of polish could have turned X-Men: Destiny into a great game, but it definitely would have propelled it from a mediocre game to a good one. Some boss battles are absolutely thrilling, and the plot, while somewhat convoluted, definitely feels like a proper X-Men story, but the dull, monotonous battles and lack of polish hamstring the game. It’s a shame, too, because most of the ingredients are here for a fun experience. The characters are different enough that we would have loved to go back and replay the game, and the combat itself isn’t all that bad. It’s just that all of the good ideas are mixed in with dull ones, and the finished product is half-baked, making this an experience worth skipping for all but the most diehard of X-Men fans. Description Discover your mutant power potential and fight alongside the X-men.